In the german version of 5.5.18 in the field "undertitel" the menu with rightclick is in English not German. GerSch, Thanks for posting. Please post a screen shot. GerSch is referring to the context-menu in the edit-control for the thought-label. 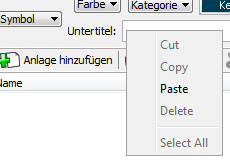 The thought-name has the same options in the context-menu, but in german. And instant search also has an english context-menu! Quick and good answer :-), mbaas!! Thanks guys. We will have this corrected.